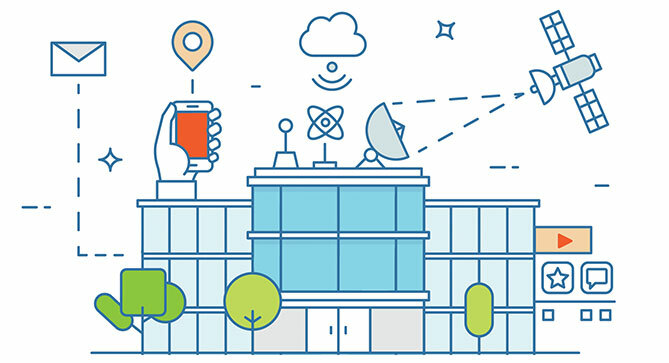 How Does “SMART” Building Data Generate Actionable Insights for Your Business? Every building is capable of being “smart” – but what does being “smart” actually mean for your business? The popularity of smart buildings has exploded in recent years within all verticals such as retail, small to larger commercial, industrial, health care and all government levels, and yet most sites in North America are not equipped with a smart base building network (BBN) and an effective long-term strategy to use it. Without these, smart building systems merely generate data that will go unused unless it’s properly harnessed and analysed. RYCOM does that and more with our HIVE™ Smart Platform. Never happy to leave a job half done, RYCOM does not leave the data at your door and ask you to make sense of it – we provide you with an innovative platform that takes data from all your interacting building systems and provides easy to understand actionable insights. How do RYCOM’s HIVE™ Smart Platform and BBN generate actionable insights for your business? Read more to find out. Before we design a BBN, we work with the building owner to determine how and where “smart” fits into the site and how it will impact both the site and tenants. It is crucial to work closely with building stakeholders to ensure that everyone’s requirements are considered when designing a smart strategy and BBN. With this feedback, a detailed blueprint can be developed that will map out the building’s unique BBN to ensure it will allow a building to realize the many benefits of smart technology. A common mistake with BBN implementations is they are either over-designed and not fully utilized or under designed and never allow for a true smart building to evolve. That is why before your business undergoes any investment of time and money, it is important to partner with an experienced team that understands the entire ecosystem of structured cabling, networking, vendor systems, system integration and property/portfolio strategies. Add all of this up and our platform provides continuous optimization and support structure to deliver the targeted performance that is necessary in today’s marketplace. No matter which smart building partner you choose, always remember that the smartest thing about smart buildings are the people who use it. It is important to ensure that you have the right partner with the right experience to work with you on your strategy, technology solutions, systems integrations and operations. Even if your building is not yet ready for a full-scale smart building deployment, it’s never too early to develop a strategy to get smart. Interested in learning more about RYCOM HIVE™ Services and Solutions? Contact one of our Sales Specialists today at hivehelp@rycom.com or 1-877-927-9266 and let us show you why we are the right smart building partner for your business. RYCOM and BUENO talk transforming building operations and business through data and analytics during IBcon LIVE News Desk interview. © 2017 Rycom Corp. All Rights Reserved.